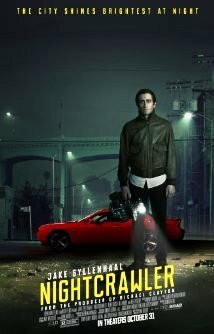 In Nightcrawler, Jake Gyllenhaal plays Louis Bloom, a fast-talking young man with a line of blather, a certain amount of charm, and a burning desire to succeed in his chosen profession. He goes around the scary streets of Los Angeles at night, looking for accidents, shootings or crimes in progress so he can film them. He then sells what he films to TV news stations, which will pay lots of money for the bloodiest and most sensational film footage—the more blood, mayhem, and human misery, the better. This is the stuff that brings in viewers. Louis hires an assistant named Rick (Rick Garcia) for thirty dollars a night. Rick is everything that Louis is not; he’s hesitant and lacking in confidence. He wants to make good (as he tells Louis, he is sleeping in a garage) but we see he isn’t suited for the kind of things that Louis expects him to do. If he had any sense, he would walk away, but, of course, he doesn’t and he comes to a bad end. Nightcrawler is intelligent and literate, if a little verbose. Louis Bloom is an interesting and complex character. Lots of adjectives might apply to him, including unscrupulous, self-aggrandizing and opportunistic. Jake Gyllenhaal is convincing every step of the way (he had an awful lot of dialogue to memorize). Also memorable are Nina (when Louis makes sexual advances, she says she doesn’t date people she works with and, anyway, she’s twice his age, which would make her about 68) and Rick, who has a kind of Ratso Rizzo appeal, although he’s a lot cleaner than that.